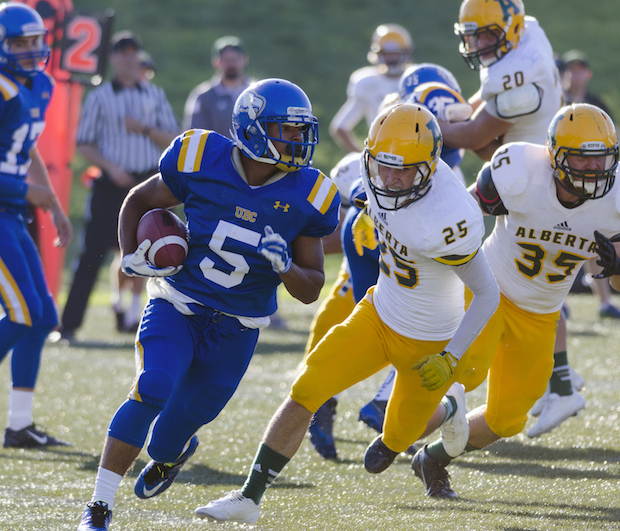 Under new head coach Blake Nill, the UBC Thunderbirds are eager to get their 2015 season underway – but first, they’ll have to battle it out against the University of Laval Rouge et Or in a historic preseason game in the first ever matchup between the two CIS schools in program history. The Thunderbirds, who went 2-6 last season, are looking for a fresh start this year and will be eager to showcase how different the team is compared to last season. Several players to look out for include Marcus Davis, who was named First Team All-Canadian in his rookie season after making a name for himself on special teams, and Michael O’Connor, who joined the team after a season at Penn State and took part in the BC Lions mini camp during the offseason. The Thunderbirds lost defensive tackle Donovan Dale to the Huskies in the offseason and will need to find another player to fill the shoes of the Second Team All-Canadian and the Canada West Outstanding Lineman awardee. On the other hand, Laval, the most successful CIS football program in history with eight Vanier Cup wins, won’t be an easy team to beat. Under head coach Glen Constantin, who has been the head of the program for the past fifteen seasons with seven Vanier Cup wins under his belt, the Rouge et Or went 7-1 last season. Several key players for the team include Hugo Richard, who led the CIS in touchdowns thrown last season with 22 and averaged 322.3 yards per game, and receiver Felix Faubert-Lussier, who caught nine of Richard’s touchdown passes last season. One player who will be missed by the team will be Boris Bede, who joined the Montreal Alouettes this season. In their first meeting ever in program history, will the Rouge et Or topple the Thunderbirds? Or will the Thunderbirds show that they’re a brand new team this season? Tune in to find out this week! After strong showings last week, the undefeated Okanagan Sun (5-0) visit the Langley Rams (3-2) at McLeod stadium in Week 6 of BCFC action. The Okanagan Sun, who defeated the Huskers 66-3, were able to record 618 yards of total offence while the defence only allowed 98 yards of offence. Among the receiving corps, Kyle Patchell led the team with two touchdowns from quarterback Josiah Joseph who completed 15 of 18 passes for 238 yards and three touchdowns. Keith Zyla finished the night completing two of six attempts for 105 yards and also his first ever BCFC touchdown pass to Terrance Williams, who also caught his first BCFC touchdown as well. The defence and special teams also had a stellar showing with Raquille Cespedes recording a 48 yard pick six and Tyler Geisler recovering a fumble on a kick-off and running it 17 yards for a major. In the Rams’ 42-9 win over the Westshore Rebels, receiver Bobby Pospischil had a standout game, catching three passes for 159 yards and a touchdown and also throwing a 71 yard touchdown pass to Nathan Lund. Dylan Tucker went eight for 14 and 226 yards, throwing a touchdown pass to Pospischil and Dallas Yassinky while rushing for a score of his own, while the other rushing touchdowns were scored by Jacob Patko and Nathan Lund. The Rams defence was also extremely effective, only allowing 75 yards on the ground and forcing seven turnovers. Among the defence, John Beckerleg and Alex Agnoletto stood out, both recording an interception and a fumble recovery and a sack, respectively. 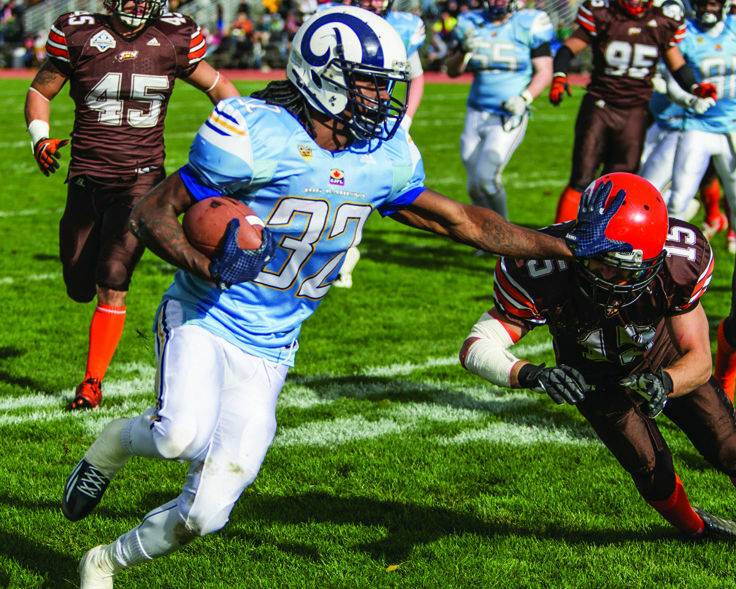 In their last matchup two weeks ago, the Sun outplayed the Rams to a score of 32-13. Will the Rams get revenge on home turf? Tune in this week to find out! 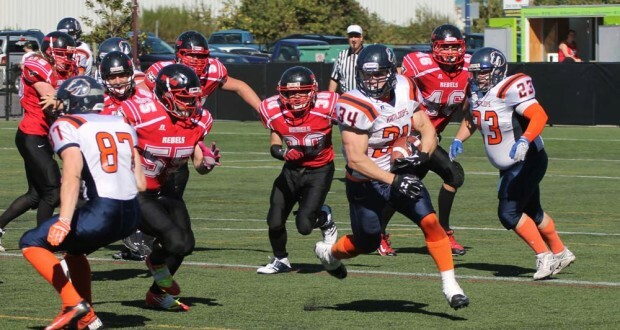 In a rematch of last week, the Vancouver Island Raiders (3-1) will visit the Kamloops Broncos (2-2) in Week 5 of BCFC action at Hillside Stadium. Last week, the Raiders held off the Broncos to win 35-26 at home and were led by quarterback Liam O’Brien, who completed nine passes for 217 yards and three scores. Dustin Rodriguez, who caught four passes for 131 yards, caught one of the touchdown passes while Arthur Fabbro caught the other two in the team’s win. On defence, the Raiders were highly effective in the second half of the game, only allowing six points and containing the Broncos offence. Dexter Shea led the team with seven tackles, while Cole Virtanen had the biggest play of the game setting a Raider record with a 95 yard pick-six. Other Raiders who shined on defense were Quinton Bowles, who recorded two sacks, and Kealan Botel, who also recorded a sack. For the Broncos, quarterback Steve Schuweiler had a productive game, throwing for 358 yards and two touchdown passes to Derek Yachison, who caught 10 balls for 97 yards. That night, Schuweiler also set a new BCFC record with 35 pass completions, breaking the 2010 record of 29 pass completions set by Jordan Yantz. Another record was also broken by Devin Csincsa, who set a new Broncos record with 12 receptions for 136 yards. On the ground, Jacob Palmarin led the team with 12 carries for 63 yards and a score. On defence, Braden Vankoughnett led the team with seven tackles, while Derek Trager and Tevin McCarty recorded and interception and a sack, respectively. Will the Raiders be able to hold off a solid Broncos offence two weeks in a row? Tune in this week to find out! 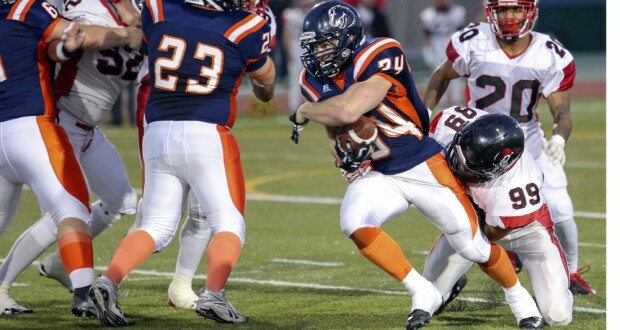 After a successful 52-0 shutout against the Valley Huskers, the Langley Rams (2-1) head to Kelowna to face the undefeated Okanagan Sun (3-0) in a rematch of the 2014 BCFC Cullen Cup championship game. The Rams are looking like a strong offensive unit this season, led by running back Nathan Lund who rushed 145 yards on seven carries for a pair of touchdowns last week. Most impressively, the Rams scoring was spread across a myriad of running backs and receivers, with Devin Logan and Jason Patko each rumbling for a score. Other touchdowns were scored by first year receivers Seye Akinsanmi and Bobby Pospischil, the latter who led the team with four receptions for 96 yards. On the other side of the ball, the defence was extremely effective, containing the Huskers to only nine yards of rushing. Jesse Cervas recovered a fumble for a score, while Brock Gowanlock and Shaiheem Charles-Brown both recorded a pair of sacks. Last week, the Sun recorded 396 yards of net offence but had to rely on kicker Thomas Huber five times to finish drives in their 27-3 win over the Raiders. The lone touchdown scored by the team was thrown by Cam Bedore to Kyle Patchell, who had five receptions for 89 yards, while former SFU receiver Kyle Kawamoto led the team in receptions, recording four catches for 105 yards. On defence, the Sun effectively contained the Raiders quarterback, collecting ten sacks with Ryley Butler and Lucas Machado recording three and two, respectively. Will the Rams be able to battle a dangerous Sun defence to hand the team their first loss of the season, or will they maintain their winning streak? Tune in this week to find out! 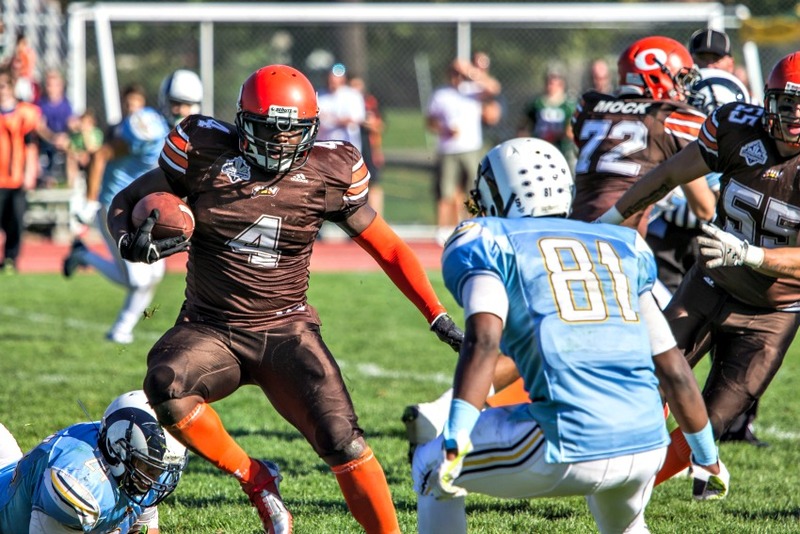 It’s Week 3 of BCFC action, and the Westshore Rebels (0-2) will face the Kamloops Broncos (1-1) at Hillside Stadium for the featured game of the week. The Rebels, who lost a tight battle against Island rivals, the VI Raiders, by a 23-21 score last week showed they could compete with one of the top teams from last season. In one of the most impressive week-by-week turnarounds so far this season, the Rebels tallied 371 yards of total offence, orchestrated by quarterback Ashton McKinnon who threw 21 of 43 for 365 yards and three touchdowns, including two to Hunter Lake who hauled in eight passes for 136 yards. On defence, the Rebels showed no openings, not allowing a single point to be scored against them in the second half of the game. Led by a strong defensive core in James Bradley who recorded a game high eight tackles, Dusean Leblanc who recorded six tackles and half a sack, and Cohan Sassaman who recorded the other half sack, four tackles and a fumble recovery, the Rebels could be a tough matchup for the Broncos. The Broncos, who lost 25-17 against the Rams last week, are led by quarterback Steve Schuweiler who had ten completions for 213 yards and a touchdown to his favourite target Derek Yachison. Yachison, who hauled in seven catches for 84 yards, spent the offseason attending the BC Lions training camp and will be a player to watch this season. On the ground, watch for Jacob Palmarin to lead the team in the running game, as he had an excellent game last week rushing 15 times for 101 yards. On defence, Michael Ochoa led the team with seven tackles while Jonaus Levac has six tackles and an interception. In a matchup of two teams who proved they can hang with the best, who will come out on top? Tune in this week to find out!